In 1908, Ivatt introduced these 0-6-0 locomotives to operate the fast goods trains that the Great Northern Railway (GNR) was introduced at that time. 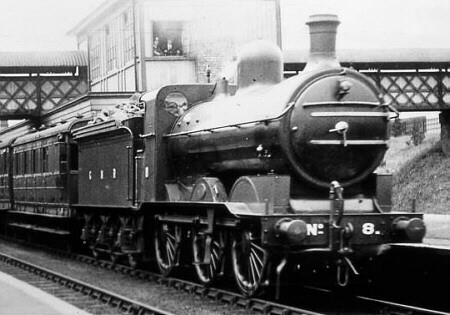 Following his own standardisation policy, Ivatt based the J1 design on that of the existing N1 0-6-2T locomotives, and used the same boiler, motion, and coupled wheels. A total of fifteen J1s were built at Doncaster. As well as being used on the N1 0-6-2T locomotives, the Diagram 7 boiler was used on the J5 and the D2 4-4-0. Many of these engines were later fitted with a superheated version of the boiler, but all of the J1s would remain saturated throughout their lives. Ramsbottom safety valves were initially fitted as standard to these boilers, but Ross pop safety valves were fitted at a later date. Many GNR classes experienced a wide range of detail variations, as changes tended to be applied in a non-consistent manner. The J1s were no exception. They were originally built with full height chimneys and domes, but many had 1.5in taken off the top of their chimneys during the 1930s. Slightly smaller dome covers were also fitted in some cases. Later in their lives, 6in shorter ex-J6 chimneys and significantly smaller domes were fitted to some of the J1s. The initial J1 allocation was six at New England, and three each at Ardsley, Colwick, and Kings Cross. All were used on the fast goods trains for which they were designed. They were also quickly used for passenger work, and a notable early working was the use of all three Kings Cross J1s on August Bank Holiday excursions to Skegness in 1909. The J1s tended to work lighter duties after the introduction of the larger K1 2-6-0 locomotives in 1912. However, the J1s continued to work passenger services for the rest of their lives, and they should rightly be classed as mixed traffic engines. By Grouping (1923), the J1s were allocated to London (7), Colwick (2), New England (1), Bradford (4), and Lincoln (1). The Bradford locomotives were used for services in the West Riding, but they were also often seen on summer excursion trains to Bridlington and Scarborough. By 1930, the J1s were concentrated in London, the West Riding, and at Peterborough. This allocation remained virtually constant until World War 2. By 1942, the J1s were divided between Gorton 8) and Colwick (7). Common wartime duties included trip goods workings, and local passenger services. For a short time in 1945, all fifteen J1s were allocated to Colwick. Withdrawals started in 1947 with four J1s being scrapped before Nationalisation (1948). There was a brief pause in the withdrawal process, but the last eleven engines were withdrawn between 1951 and 1954. The last J1 to be withdrawn was No. 65013 from Hitchin. Whilst at Hitchin during the 1950s, No. 65013 was called upon to replace failed express locomotives on two occasions. One of these included the unaided haulage of a heavy fourteenbogie train to Kings Cross after a Pacific had failed. Heating Surface: Total: 1250 sq.ft. None of the J1s survived into preservation. ACE Products sell a kit of the J1 for 7mm scale (O gauge). Thank you to Malcolm Peirson for the photograph of GNR No. 8.